There is no better time for eating than summer – or well, late spring through early fall. Okay, so there’s a lot of good time for eating, but my point (and I do have one) is that there is nothing so wonderful as the riot of flavors and colors that fresh produce bring as the weather turns warm. My garden (which I’ve not shared much about this year) is going swimmingly. The potato patch is insane. I’ve got kale and chard coming out of my ears and the tomato plants look promising (knock on wood and anything else that will help). Some plants have not liked the unpredictable weather (the peas are struggling this year and the bugs ate all the beans) and I’m dealing with a new wildlife threat. It seems that my geriatric dog was more threatening than I supposed and now that he has left us for the great beyond the neighborhood deer have found (and leapt into) my garden. One bold little doe had a great, and very large, salad of strawberry leaves and chard before we scared her away. I’m testing various repellent measures and will let you know how it goes. For the moment, she seems to be favoring my hostas over my berries and I like that just fine. Despite the intruder, I’ve picked about 12 pounds of strawberries in the last 6 days. Yes, I said 12 pounds. For some quick practical math – organic strawberries are currently going for $4 a pound at my local Wegman’s. I spent $0 on my strawberry patch this year. $0. I mulched with dry leaves late last fall and have only sprinkled some organic slug deterrent – okay so I’ve probably spent .50. I’ll round it up to $1 for fun. My 12 pounds of organic (and awesome tasting) strawberries would have cost $48 at the market. I got them for $1. I grant you I bought some strawberry plants a couple of years ago, but I’ve harvested every year. We’re well into the gravy zone. I thought I’d share some strawberry info with you so you can pocket $47 worth of free and super healthful organic fruit too. We’ll start with WHY strawberries are awesome, then I’ll talk gardening. If you absolutely don’t want to grow strawberries, skip past the gardening bit and read about storing your berries so you can take advantage of summer’s berry bounty (and lower prices). Why NOT eat strawberries is my answer as I am a strawberry freak, but from a nutritional perspective this question deserves an answer. Recent research suggests that strawberries may be one of the most abundant and biologically available sources of antioxidants out there – even better than most vegetables (yes, I said that). They also seem to be helpful in blood sugar regulation and may even be anti-inflammatory (more details on all these claims here). 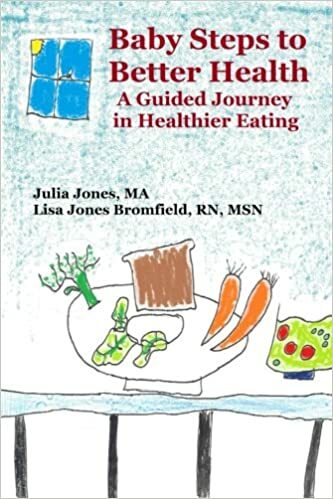 There is evidence that strawberries may be helpful in preventing cancer and in slowing cognitive aging as well. So, not only do you really want to eat strawberries, you really SHOULD eat strawberries – isn’t that lovely?! I’m just gonna go down and dirty here, but there’s a TON of info on these here internets on how to grow strawberries, including this EXCELLENT article. I’m going to tell you what I do with the mutual understanding that I am not a professional, and you may well have better results doing entirely different things. 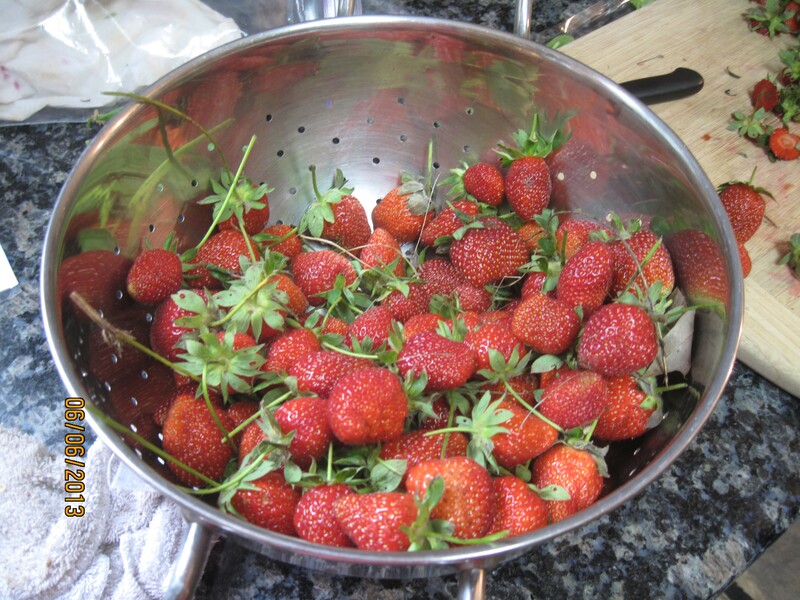 I have grown strawberries a variety of ways – in pots and in the ground. While I have better results in the ground, I know plenty of people who do better in pots and I think they probably lose less fruit to bugs and rot than I do. I plant my strawberries where they will get at least 6 hours of sun, but both of my patches get filtered light at other parts of the day (shaded on the one hand by a shrub shadow and by asparagus fronds and raspberry canes in the other patch). Ideally they should be hilled up a bit so that the fruits don’t touch the ground when they get large and heavy. Most of mine were not hilled when planted years ago and I’ve only begun to remedy that. Strawberries should not be picked the first year (or at least not many), but can be harvested subsequent to that. They will spread as far as you let them. I find the best way to get good harvests is to pick continuously through the production season. Every day. This also prevents critters from getting quite as many. With that said, they will not ripen much once picked, so you want to be sure that they are completely red before picking – no white tips. When picking, be careful not to pull too hard on the stem as it is easy to accidentally pull off other stems connected to your berry and miss out on more strawberries. Post season I keep the plants trimmed to keep them from taking over the entire garden and then when it turns cold I cover my patch with dried leaves to protect it from winter’s coldest. Many gardeners say dried leaves are too heavy – I haven’t found this to be a problem. I simply uncover the plants early so they don’t suffocate under the weight of wet leaves in the spring. I watch for late frosts and use a fabric cover to protect them overnight if we get a big cold dip. They start growing and I sprinkle on a little compost when I prepare the rest of the garden if I think of it; the remnants from the leaves seem to do most of the job. If I think of it I feed them w/ a little organic fertilizer or compost tea. That’s it. If you’re a novice gardener, or you’ve wanted to try but don’t like a lot of bother, I think strawberries are a great bang for the gardening buck and effort – especially since they’re so dang yummy. What a divine problem. 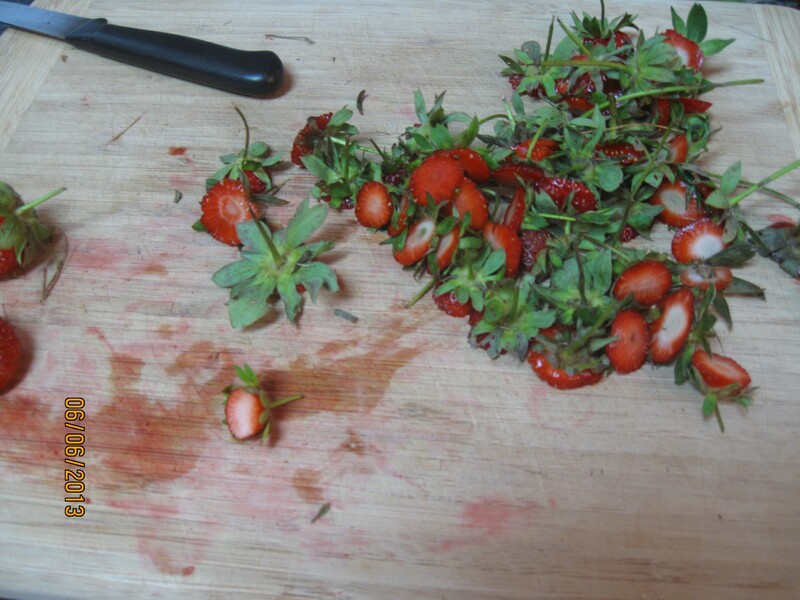 It’s important to note that strawberries (particularly homegrown) do not keep well. They also become lessnutritious the longer they sit. You can make jam and a variety of other things to use up your strawberries, but the Sis sisters both prefer the laziest possible strawberry preservation method – freezing. When you buy berries at the grocery store, they are usually packaged in the plastic clamshell with holes, this is to prevent moisture from building up and causing the berries to rot even faster than they usually do. 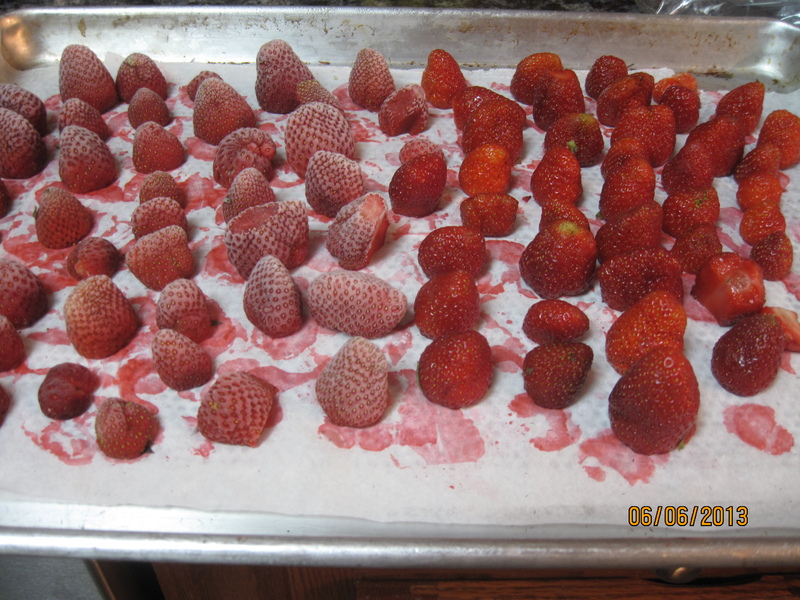 For home berries, I place a paper towel or a dish towel in the bottom of a plastic bag which I leave partly open. I check the berries just about every day and when they are getting too dark (sort of dusky looking) or if they are marred in some way that might cause a very picky child to turn her nose up at them, I simply remove them from the bag and place them on wax paper on a baking sheet in the freezer. 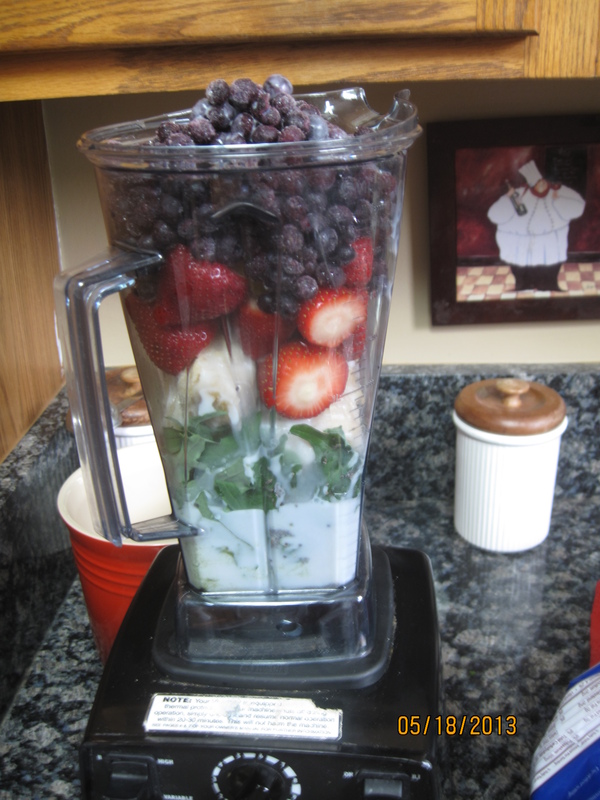 I actually cut the leaves off – Bigg Sis does not and I am going to adopt this approach as most of my frozen berries are smoothie bound anyway. What do they know? 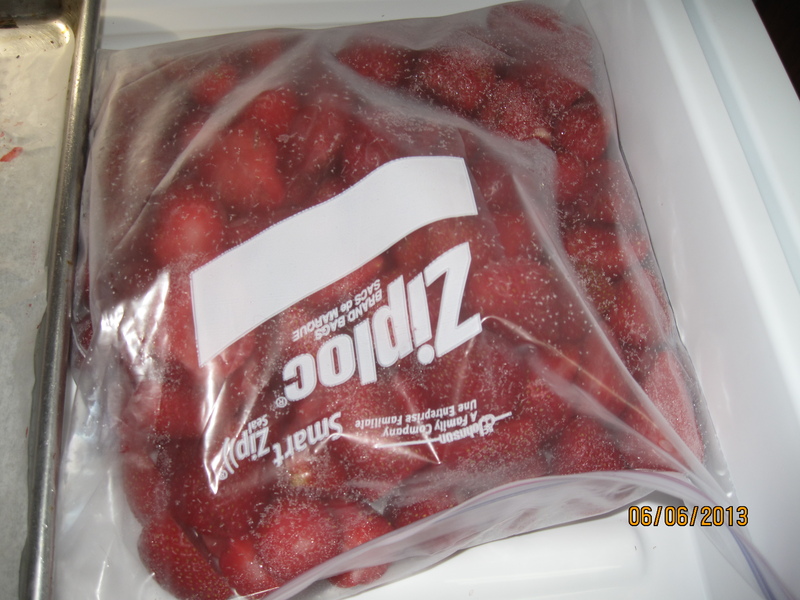 When the strawberries have frozen completely, I transfer them to a ziploc freezer bag. Then I have huge bags of frozen organic berries (which cost approximately $1 million at the store). This method also works for storebought berries and can save you a bloody fortune in the off season. Stock up, freeze em and enjoy those low prices year round. Delish! A garden isn’t complete without strawberries. I have planted them at just about every home I’ve lived in. Our weather has been cold and rainy so they aren’t ripening very quickly but today we found our first 9 ripe berries. We shared them around, even with a neighbor with an average of 2 a piece. I had to smile as each person savored the taste, not gobbling them down, and a couple even moaned in gratitude at the juicy sweetness. The 4-year old pronounced them so much better than the store bought ones. I love looking at the middle of a homegrown berry and seeing that vibrant red all the way through. Glorious. Great tips! We had strawberries but they never produced much and now nothing. I guess we don’t know how to take care of them properly(which doesn’t suprise me at all!). I think the plants have a limited lifespan – starts slow, peaks and then peters out. That’s just my hunch. Many of the ones in my patch were there when we moved in and I’ve periodically thinned them and moved them elsewhere. If you’ve still got some you might try re-planting them to see if they are revived for next season. Thanks for stopping by! And by that I meant replanting in a pot or changing their location. I always try these things small scale. I moved three plants to another bed to see if they’d take before I started moving more. No, you simply love strawberries. I’d love to hear about your findings as I am nowhere near as scientific. I’ve no idea which type are where. It’s just a strawberry jungle out there. 12 pounds of Strawberries! Just Awesome! And counting! I guess they like the weird Spring we’ve had. Thank YOU for hosting! My plants are still going. Curious to see how much we get by the end of the season. We’re up to about 16 pounds now. LOVING my Strawberry plant this year! 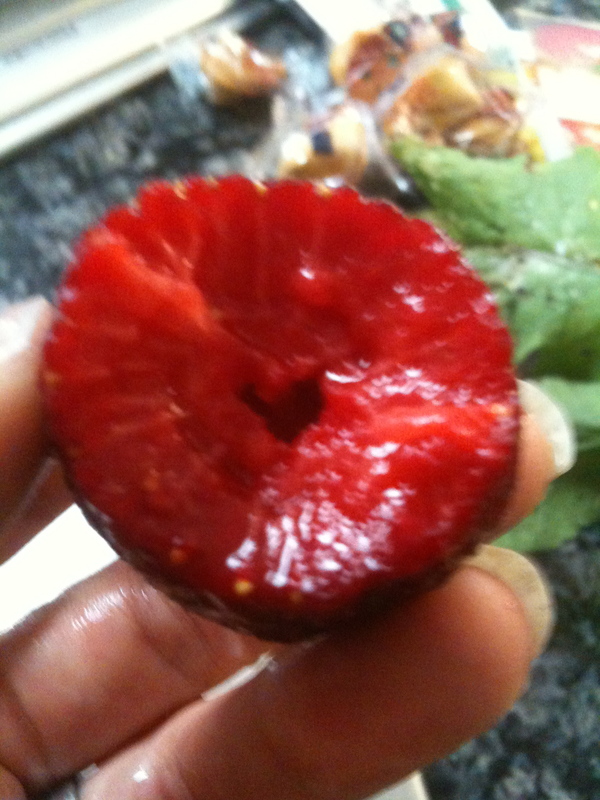 It’s my first year for fruit, and I was wondering if you know – does the fruit get sweeter as the plant matures? I have gotten a lot of very tart (almost too tart) berries. Im not too concerned as I plan to be making some jam with the ones I froze, but thought maybe you might know the answer?? Those bunnies are voracious if my sacrificial patch is any indicator. Hope they save some for you! The season is much too short. Agreed. Looks like mine are slowing down already, although my deer friend eating so many leaves and flowers may have helped with that. I’m so envious of your strawberries! They are on the list of plants that we’re gradually adding to our garden, but we haven’t made it there yet. We’re actually about to add several blackberry bushes and last year I planted several blueberry bushes in the fall. This spring we also put in a red currant to mix things up, but I have my heart set on strawberries; still figuring out where to put them! I loved reading about how healthful they are; fortunately, my extremely picky younger son adores all berries, including strawberries. 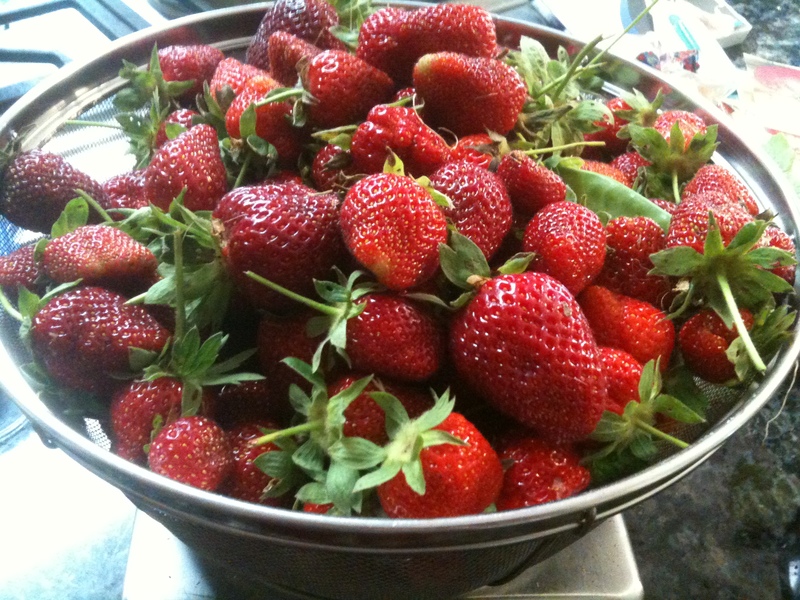 Wow…12 pounds of strawberries already. I’d say you really have a green thumb. 🙂 I hope you can control the deer. I’m enjoying your “Strawberry Joy”! I have a question–how do you maintain your patch, from year to year? Do you ever plant new plants, or do you let the older ones continue to spread? I let the older ones spread some, and occasionally add a new plant. Last year I pulled a bunch from the main patch to thin it and planted them in another patch. I think they have a lifespan, so new ones once in a while seems like a good idea, but that’s my gut, not horticultural knowledge talking. Stopping in from Hearth & Soul. I’ve grown a lot of things, but this year is my first year for strawberries. I appreciate all the info you have here! Our pleasure Michelle – Happy Berrying! Definitely my favorite berry. You are so blessed to have such an abundance of them! Enjoy! I am making strawberry frozen yogurt as we’re speaking! I still can’t believe I grew all those strawberries. Just about my favorite plants in the garden right now. Yay! When they’re good, they’re so very good! Yay! I’m afraid our season got a bit interrupted when the deer ate most of the 3 round of blossoms… hoping we’ll eek out a comeback. Still got about 20 lbs of berries, which is not too shabby, if I do say so myself. Hope your harvest is awesome! When we lived in the country, my husband would get hair clippings from his barber and put around the edges of our garden. Evidently, deer do not like anything which smells human. We always planted beans after July the 1st. Guess the bugs did not like the heat. We also companion planted marigolds in the bean rows. Just suggestions. Ooooh, so I could still save the bean situation. Excellent, thanks. I’d heard about the hair thing too and little man is in for a big trim this weekend, so I’ll give that a go. Thanks Regena! We’re enjoying our strawberries now, too! We have less than last year, though, because the moles (well, their hills) killed quite a few last fall. Sigh. I’ll definitely be planting more! Thanks for sharing your tips! We love growing all kinds of berries… they are really easy to grow we just cover them with nets so the birds won’t eat them.. bummer about the deer. Thank you for sharing your strawberries with us on foodie friday. Our pleasure Diane. Thanks for hosting every week. The good news is the doe seems to have been repelled by the old soap trick. So long as I don’t have to up my game any, I think we’re in good shape. She is happily destroying my hosta but I don’t really care. Cheers! Thank you so much for sharing your great recipe with Full Plate Thursday. Hope you have a great week and come back soon! I am so glad that my worst competition for my produce is grasshoppers…though they can do a lot of damage around here. There are deer nearby but I guess our neighborhood is tight enough (or has a large dog population?) that they’re not a problem. Wonderful tips on growing strawberries, and using them. Raising your own food can be such a pleasure (if you don’t mind the sweat and grime too much…I don’t). It IS such a pleasure. In winter when I’m struggling with seedlings I always wonder if I shouldn’t just skip the season and join a CSA to save myself the trouble, but there’s nothing like having your appetizer while still standing in the garden. I think in order to really deal with our deer long term we’ll have to get another dog, which given a couple more months I think I’ll be very ready to do. Wow, that is a lot of strawberries! Lucky you! Such great info! I keep trying to grow strawberries, but then we keep moving 😦 One of these years we’ll decide to stay put, and I’ll actually get to enjoy the money saving organic strawberries. In the meantime, I’ll just spend all our fun money on the delicious berries. Thank YOU Adelina for stopping by! 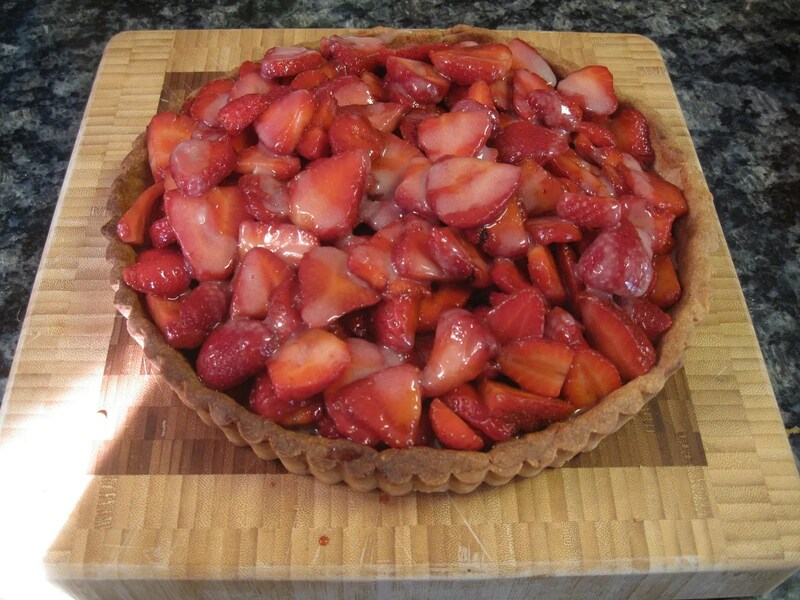 Thanks for sharing recipes and ideas for strawberries at Foodie Friday. We love them! Hard to beat a fresh strawberry! Thanks for hosting every week! Today was our first day to pick strawberries… they were wonderful! I cant wait to freeze them and make jam! Every year I wonder if I should let them have so much space… then I pick them. Enjoy! Excellent post! My family also grows strawberries and there’s really nothing better than a freshly picked strawberry. 🙂 I found your blog through the Mondays Block Party @ Making the World Cuter!